Beretta Old Model 92S Magazines ACT-Mag 9mm 17 round Bright Blue Italian Made Act Mag B92S17B Buy 3 Ships Free! Description: Restrictions apply on high capacity magazines in several states, so please read this entire ad carefully before bidding or offering to buy. This listing is for ONE magazine. Buy 3 Ships Free: Combine any 3 of our non gun non ammo listing lots, and the entire order ships Free. Here are excellent ACT-Mag Italian magazines originally designed for current and recent production 92F Series Beretta Pistols, that our friendly local machinists have modified to fit the older 92S series pistols with European Magazine releases. They will still fit the 92F / M9 series pistols. Manufacturer is ACT-Mag s.r.l. of Gardone V.T., Italy. Exclusive Importer and warrantor is Fusion Engineering of Venice, FL. These are superbly finished blue steel magazines with high impact polymer cartridge followers and floorplates. Each magazine holds 17 rounds of 9mm ammunition: 9mm Parabellum, 9mm Luger, 9x19, call it what you will, THE 9mm. Like their chief competitor Mec-Gar, they lock the Beretta open when it fires dry like they’re supposed to; they free-fall eject like they’re supposed to, and most important, they hold spring strength and function reliably in all manner of environmental conditions and even when left loaded for months at a time. These magazines will fit any Beretta 9mm metal frame pistol that has its magazine release beside the trigger guard OR on the left lower side of the grip frame, and that accommodates a double stacked magazine. That includes models 92S, 90-Two, 92SB, 92F, 92FS, and M9. They will fit 92SB and 92FS Compacts, but will protrude from their grip frame of course. They will also fit any 9mm rifles designed to accept Beretta magazine like some variants of the CX4 and Kel-Tec Sub 2000 rifles. 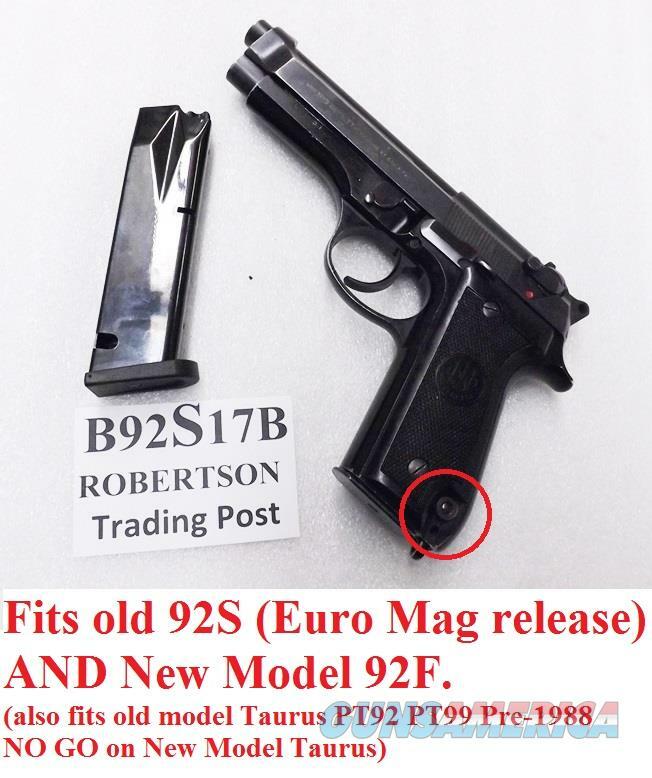 They will not fit a Taurus 92 or 99; but now they will definitely fit the old model 92S Berettas made before 1984, that we had several of at press time on this ad. Factory Beretta Magazines have sold as high as $50 apiece in our area. We’re offering the ACT-Mags in the photos, however, or their identical mates, each	for only	$ 25.00. They will still fit 92F and M9 Pistols, but they’re a little higher. Not for sale to civilian residents of California, Colorado, Connecticut, District of Colombia, Hawaii, Maryland, Massachusetts, New Jersey, or New York. Any ammunition, firearms, or personnel in our photos are Not included.